In today’s industrial environments, there are many types of hazardous conditions. Whether or not it’s wood chips, gas vapor, flammable powder, or many more things, the pace of industrial productivity and performance can accidentally add the final element to a potentially deadly situation. Therefore, it’s extremely important that you find reliable scales that are rated to be used in hazardous environments. Here in Long Island, New York, Arlyn Scales has been leading the weighing industry with innovative and safe scale designs for the past thirty years. Not only do we make our scales accurate, rugged and reliable; but we make sure we have a broad selection of scales that function safely in environments rated to be Intrinsically Safe and the National Electric Code (NEC) as hazardous. We manufacture these scales in our New York based factory, which means we’re able to ship factory direct. This helps bring the customer’s price down since there are no distributors marking up the price along the way. Since we aren’t paying additional costs either, we are able to invest even more money into our scales. Our customers get a cutting edge scale that our competitors can’t beat, in terms of quality and price. One of the greatest strengths of our ArlynGuard scales is our stainless steel load cells and how we design them and their placement within the scale. But before we can get into why this is a benefit, we must first understand a little bit about how a load cell actually works. A load cell is attached to the scale between the platform and the bottom of the scale. Any load on the platform is transferred to the load cell. The load cell is precisely machined using computer controlled devices, and incorporates four thin sections, called flexures. Strain gauges are bonded onto the flexures, and they bend as the flexures bend. This causes a change in resistance of the gauges, which are wired together in the form of a Wheatstone’s bridge. The voltage output of the bridge changes as the resistance of the gauges change, and this voltage is translated into numeric form by an Analog to Digital Converter. The output value corresponds to the weight on the platform. While the design itself works well, the problem is the materials manufacturers use when constructing their strain gage load cells, usually aluminum or an inferior kind of steel. While certain scales work well with an aluminum load cell (usually smaller capacity scales), strain gages aren’t a good match for this type of metal. Because the piece of metal needs to be so thin, aluminum strain gage load cells are extremely susceptible to damage from shock and overloading as well as drifts in accuracy due to temperature and air currents, all of which affect the accuracy of the load cell. We choose to manufacture our load cells using stainless steel, which makes our load cells far more reliable and even more rugged. Additionally, because we machine these load cells at our factory, weÕre also able to match electrical outputs. This eliminates the need for a summation board and its moving parts, the single most vulnerable electrical piece of equipment in the scale. Since this board is gone, we have reduced the risk of damage to the scale and eliminated a possible source of electrical current and sparks in a hazardous environment. This design is standard in all of our ArlynGuard scales. Our ArlynGuard B Scale has no moving parts.It is able to be used in most classes of hazardous locations from flammable gas and vapor, fine powder or dust, to cut and pulped wood in daily use. This scale can also be used around most groups of hazardous substances from flammable materials (acetylene, hydrogen, butane, etc.) to conductive materials (aluminum, carbon black, starch, etc.). Like the other ArlynGuard scales, it has a digital indicator with a molded display enclosure with rubber gaskets to protect from moisture and corrosive interaction. It has a weight resolution of up to 0.0002 lbs. and capacities ranging from 5 to 150 lbs. The C scale was specifically designed for the weighing of cylinders that contain flammable gas. It comes in three capacities: 60, 300, or 400 lbs. This is an ideal scale to use in a hazardous environment containing gas, butane, propane, etc. due to its classifications. It (along with the other ArlynGuard scales) has a 3800mah NiMH C Cell Battery with two spares and a recharger for the scale. Since batteries can be a contribution factor in a combustible environment, please change the batteries in a safe environment. The P scale comes in a wide variety of platform sizes from 20″ x 27″ x 1/7/8″ to 36″ x 36″ x 1 7/8″. Both the aluminum and stainless steel versions give you a scale that will not produce sparks. Additionally, the low profile of the platform makes loading easy and safer when moving hazardous materials on and off the platform. This scale comes in a capacity of either 500 lbs. or 1,000 lbs. 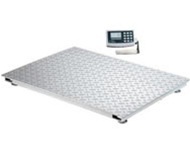 Our ArlynGuard F scale is designed to be a floor scale in hazardous environments. It’s the scale you want when you need to weigh large capacity loads. It has a starting capacity of 2,500 lbs. and we offer models that have a top capacity of 20,000 lbs. Whatever your weighing needs for hazardous environments, our customer support staff will be happy to assist you however we can. Our staff is highly trained in both our product line as well as the FM Approvals and NEC codes. We can assure you that we will help you get a scale that meets your hazardous environment needs and won’t cost any more than necessary. Should you find that our scales don’t quite meet your expectations, we will be more than happy to sit down with you, show you some custom options, and manufacture a scale that is tailored to your specific needs. Contact us today by calling (800) 645-4301 or through the form on the Contact Us page of our site. At Arlyn Scales, our customers and their safety is always the top priority.